Cruises aren’t for everyone, but I enjoy them and in certain parts of the world, I think they make a lot of sense. It’s the perfect start to an Alaska vacation and I know it’ll play into my someday trips to the Norwegian Fjords and Greek Isles. If you’re just getting started in the cruising world, here are a few of my favorite resources for sea-based adventures. There are thousands of cruises every year, so finding the perfect fit for you means digging through options. Vacations to Go, an online travel agency, offers the best search engine. You can search by cruiseline, specific ship, date range, duration of sailing, ports of call, budget, or more — making this a comprehensive tool. For basic searches, use their “Find a Bargain” option. 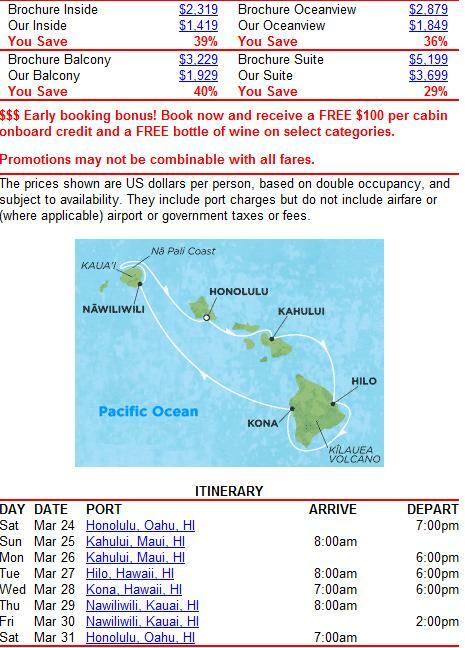 If you’ve ever wanted to sample the Hawaiian islands, you can search to find a great cruise for you. Just fill in the options you really care about and then click on “Show Me the Deals!” to see your search results. Their engine will return up to 500 cruises, so if you are getting more results than you want to wade through, be more specific in your search. Usually, you can get a subset of a manageable number of cruises to look through. Click to see more information on the specific prices for different room categories and the exact itinerary. Notice that the advertised price on the summary page is the price of the lowest-category room and that upgrading to a better room will cost extra (just like in hotels). By digging into the details of each itinerary as well as reading information on the ship (more details on that later), you’ll be better able to find a cruise that suits you. Once you have a sailing that interests you, Cruise Compete is one of the quickest ways to get price quotes. These days, most cruises cost the same regardless of where you book, but different travel agencies often throw in a bunch of extras. Want spa credit, free drink packages, or more? Ask around for the lowest prices and/or extra amenities. 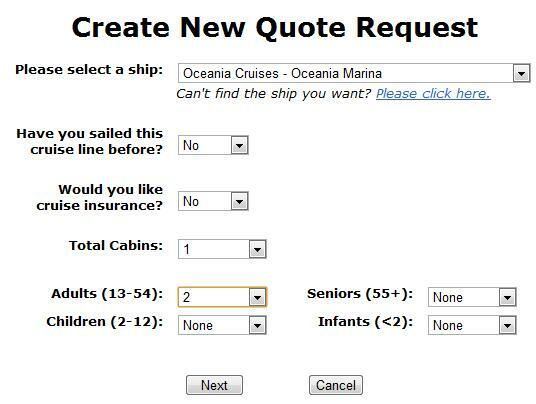 Getting a cruise quote is quick and easy. Simply input the cruise you’re interested in sailing, and then sit back and relax while different agencies send you price quotes. Over the years, I’ve booked my cruises directly through the cruiseline, through Vacations to Go (highlighted above), and through two different Cruise Compete partner agencies. All have been equally easy. The last of the great cruise resources is Cruise Critic. This website has a little bit of everything, but frankly I think the articles are too basic. The two best parts of the website are user-generated: Member Reviews and the Forums. The member reviews are great for getting a feel on which cruise line, ship, and itinerary will work best for you. Past cruisers share their experiences with accommodations, dining, excursions, onboard activities and even the nitty gritty like internet speeds, the cost of a martini, or which entertainers to watch. The forums are even better, since they’re interactive and the community is (mostly) friendly. Start reading to get the hang of how cruises work and feel free to ask questions! You’ll easily find the answers on what tours are recommended in each port, what add-ons are worth the cost, and even which ships are the most eco-conscious. Overall, these three websites are basically all you need to get settled with a great cruise – every step for finding a cruise, booking it, and then researching what to do while on vacation! Enjoy your time at sea…I do! Know someone who’s booking a cruise? Share this post with them! Cruise Compete can be good, IF (and I put that emphasis deliberately) you have a very good idea of the cruise that you want, you know what you will be getting, and you don’t need handholding or special services. CCompete leads you to agencies that strive to compete on price, not on total value and services for your dollar. Consequently, if you don’t need, want or expect travel agent service but just want a booking service, it may save you money. If you want agents with expertise to help you with your planning and booking, perhaps look elsewhere. @MCD527, This is absolutely a great point and something I overlooked since I never look for help in choosing destinations (I prefer to do my own research). While I am guessing that most of my readers are also capable of doing their own research, there are definitely people out there who could benefit greatly from using a travel agent. The potential extra cost could pay for itself if you have a lot of questions and need help planning the perfect vacation.